The Suns energy is free, it just needs to be harnessed for heating your water. A typical system can provide up to 70% of your domestic hot water requirements. The solar heating panels we use incorporate a specially designed material for absorbing the suns radiated energy. This material absorbs the suns rays extremely efficiently similar to the way black clothing absorbs heat from the sun. 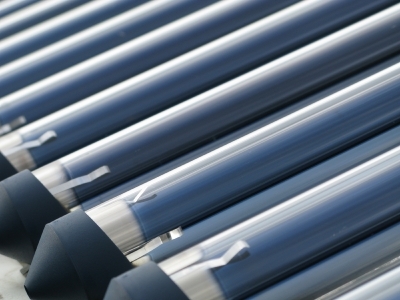 The solar heating panels are also designed to hold on to the heat it gains so very little energy is lost. Due to these factors the panels are still effective in low light conditions and will even provide up to 30% of the hot water requirements in the winter months. The aim of a system should be to achieve 100% of the hot water required during the summer months with an average provision of 60% of a total years hot water. When the panels have absorbed the Suns energy, a network of pipe surrounded by the special absorbent material is heated up. When the water in this pipe reaches a temperature higher than the base of your hot water tank a pump will be activated and will carry the heat from the solar panels to the hot water tank. They are aesthetically discreet and look very similar to a Velux window when integrated into the roof. They come with a 20 year guarantee. Higher peak temperature than evacuated tubes. They are excellent at collecting energy in low light conditions. Ideal for providing back-up to a homes heating. Slightly higher overall annual efficiency compared with flat plate panels.